A growing local food community, anchored by Jason DeLoach's F.M. Guess Pecan Company of Valdosta, the Packhouse Market of Hahira, and of course Jim Fiveash's Food Store of Hahira. Let's not forget the Valdosta Farmer's Market (1500 South Patterson Street) and Farmer Brown's Produce. 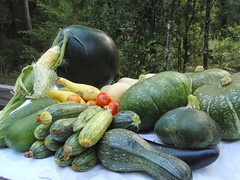 There's even at least one local CSA (Community Supported Agriculture) starting up. Long distance transportation: Interstate 75 near I-10, numerous state highways, and an airport. Delta Airlines (I never thought I'd be writing this) for competitive airfares (except during holidays). And landing on one of the longest runways in the state. 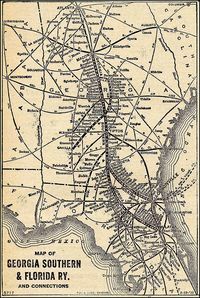 Railroads going in every direction carrying freight, which can also carry passengers whenever state and local people and governments get organized to do it. Businesses moving in to take advantage of the transportation; working towards enough good jobs that young people don't have to move away to find one. County and city governments that are at least a little bit sceptical about exactly which businesses they encourage to move in. Moody Air Force Base, by far the biggest employer, bringing diversity to the community both in serving personnel and in later retirees. Two hospitals: South Georgia Medical Center and Smith Northview Hospital. There's even a Valdosta Metropolitan Statistical Area (MSA) including the counties of Lowndes, Brooks, Lanier, and Echols, with a combined population of about 130,000. This is enough people to try things without waiting for Atlanta or Washington to tell us what to do. Valdosta State University, one of two large regional campuses of the University of Georgia System, and one so active politically that it got its own voting precinct this year, the only college precinct in the state. Live election results during each election, on the Lowndes County website. It's the only county in the state that does this! Georgia Military College, a liberal arts junior college. Valdosta Technical College, or whatever it's being called since the state reorganized it. Thriving downtowns in Valdosta and Hahira. First Friday, Winterfest, Honeybee Festival: those are doing more to attract attractive businesses than any number of road projects. Grand Bay Wildlife Management Area, preserving a little bit of the original ecosystem of the area; you know, pine trees, live oaks, wiregrass, pitcher plants, cypress swamps, alligators, great blue herons, and bobcats. Maybe you don't. Go and see! Trees, for forestry, and for themselves. 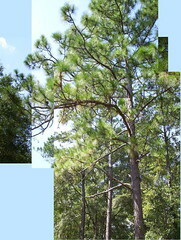 See Patterson Street (a little planning kept it from looking like Ashley Street), and the oldest longleaf pines in the county are on the VSU campus; older than Valdosta. There are even a few left elsewhere in the county. Protecting forests is not just the right thing to do, it's good business. Rain, so trees and crops will grow. Sunshine, much more than Germany, for example, so we can do solar if we want to. Winning sports teams in Lowndes County and Valdosta high schools and VSU caused ESPN to name Valdosta TitleTown. Maybe that winning attitude can carry over to improving academics. Theatre at the Dosta, VSU, and the high schools. If theatre was a sport, we'd be winning that, too! We live in an area with many advantages. You can probably list more of them. Why stop with what we've got? Why not play up our advantages of transportation, natural environment, local culture, etc., and attract jobs for young people and make the place even better for everybody? Germany, the world's leader in photovoltaic which turns sunlight into electricity, had 5.3 GW installed at the end of 2008, including a previous record 1.6 GW added in 2008. That was about a third of the world's total of 15 GW. Three GW installed this year would produce as much power as three large coal-burning plants or three nuclear power plants. Remember, Stuttgart gets about as much sunlight as Pittsburgh. And that's in the sunny south of Germany. Georgia gets as much sunlight as Cyprus in the Mediterranean or Algiers in Africa. Long-term jobs that cannot be exported will also come from developing workers skilled in the installation of solar photovoltaic (PV) arrays, and solar heating and cooling (SHC) systems. 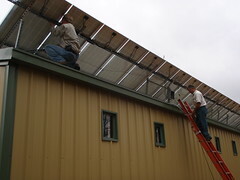 Led by the Florida Solar Energy Center (FSEC), a research institute of the University of Central Florida, six southern states, Puerto Rico and the U.S. Virgin Islands will join together to create a “Southern Regional Resource and Training Program” to train a robust workforce in the installation of solar technologies for the burgeoning solar industry. Southface will deliver solar installation training through its new Green Jobs Training Center, and will serve on the program’s advisory board. This project will create the Southern Alternative Energy Training Network, which will develop industry-recognized and staff-alternative energy training centers throughout the southern U.S. The resulting programs will create a trained pipeline of workers to meet current and future employment demands needed by the solar industry. UCF is the coordinator, but there's no reason a training center couldn't be in Valdosta. Who at VSU should be involved in this? "The technology of planting trees or replanting forests is thankfully free, and it has no side-effects," said Sukhdev, who also leads the UN Environment Program's Green Economy Initiative. "It's powerful, it's effective and it's time tested. We just have to get people's mindsets changed to start using these natural technologies that are available." Or just don't cut down trees when paving roads. 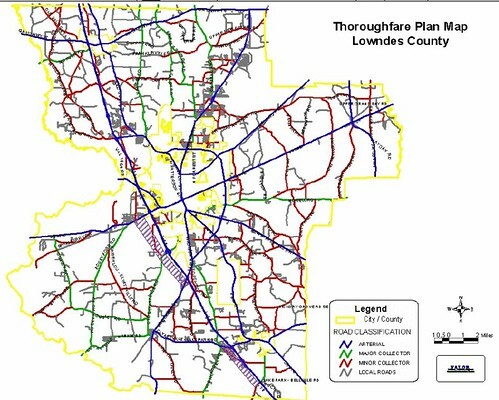 Lowndes County is proposing to update its Thoroughfare Plan. The current one was approved in 2003. The draft sent Friday by the County Engineer to the Commission for approval today is here. 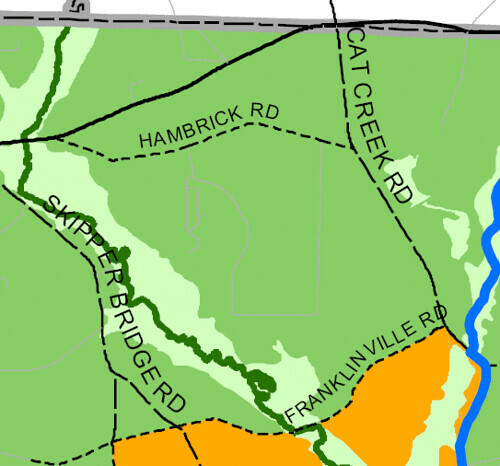 In addition, here is the county's Road Inventory. The first of these items is available on the Lowndes County web pages. The other two items don't seem to have been posted there yet. These public documents paid for by tax dollars were obtained through public records requests and are being posted by LAKE as a public service. ...works as a guide for development and potential use changes in property.